Wealth transfers are without a doubt, some of the biggest obstacles we face as we attempt to save money and build wealth for the future. 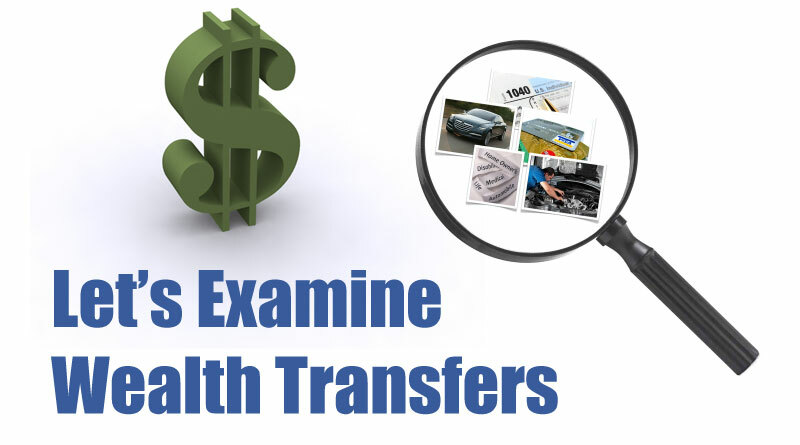 Understanding what wealth transfers are and what you can do to avoid them, or reduce their impact on your financial life, is extremely important if you are going to come anywhere close to achieving your maximum financial potential. Consider your car payments, when you make a payment to the financial institution of principal and interest, they deposit your check into their account for their future benefit and use, not yours. While it’s true you are receiving many great benefits from your opportunity to drive the car they financed for you, but the actual dollars you sent them in the form of payments, are a wealth transfer! You are never able to enjoy any of the future financial benefits those car payments are producing for the finance company. Let’s consider the financial impact or wealth transfer we experience in the purchase of just one car. Suppose you decide to finance a $20,000 car at 5% interest for 48 months. You would have a payment of approximately $460 each month. At the end of 48 months you will have paid the finance company just slightly over $22,000 dollars. This represents your initial wealth transfer. You have the vehicle but you no longer have $22,000 dollars. But the wealth transfer doesn’t stop there. The finance company can continue to loan your $22,000 for as long as they are in business! If the finance company was able to reinvest or re-loan your money at 5% for the next 40 years, your $22,000 dollars would now be worth over $140,000 dollars! Had you not needed or wanted a car, you could have saved and invested your $20,000 dollars at 5% for the same 40 years and you would now have the $140,000 dollars instead of the finance company! This is what is meant by a wealth transfer. By the way, this wealth transfer would occur even if you paid cash for the car. The only difference is, a car dealership got to use your $20,000 for their benefit and investment purposes. And more than likely they earned a lot more than 5% per year on it! So in actuality, you finance everything in your life. If you pay cash, you give up the opportunity to earn interest on that money forever, just the same as when you finance something, either way there is a cost and the money is out of your control and does not grow for your benefit. There are many more wealth transfers in your life. For example, credit card payments. Again, every payment leaves your checking account never to return, never to accumulate or earn interest for your benefit. Taxes are another wealth transfer. State and Federal income taxes are wealth transfers. Sales taxes are wealth transfers. Gasoline taxes, property taxes, virtually all taxes are wealth transfers! While it’s true that there are some taxes, such as Social Security you may ultimately get some of the money back, but with most taxes, that is not the case.